5mm pitch PCB teminal blocks with a low profile 10mm height design, screw terminals and black UL94-V0 flame retardant PA66 housings. 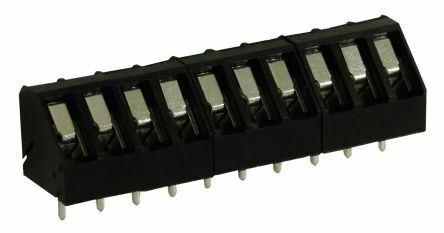 These 5mm low profile terminal blocks have stainless steel wire protectors, M2.5 nickel plated stainless steel screws, guided pin alignment and accept a wire size range of 0.3-2mm2 (22-14 AWG). 5 mm pitch PCB terminal blocks with 45° angled design, professional rising clamp terminals and black UL94-V0 flame retardant PA66 housings. These 5 mm low profile terminal blocks have M2.5 nickel plated steel screws and accept a size range of 0.2 - 3.3 mm2 (24-12 AWG).